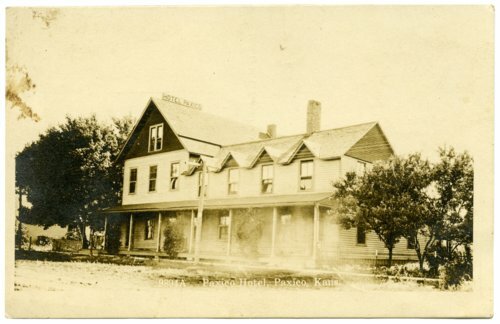 Postcard photograph of the Paxico Hotel which was located at 201 Newbury in Paxico, Kansas. The hotel originally stood in Newbury, but after the Rock Island Railroad came through Paxico, the building was moved from Newbury to Paxico, and an addition was made to the north side of the building. The message written on this postcard invites the recipient, Flora Appenfeller Stratton, to "come see us before we tear the house down."